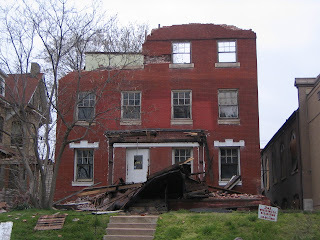 Demolition is began this week of the three homes on Washington that first caught my attention almost exactly a year ago. 4011 & 4021 had been bought by Saaman Corporation in late 2005 and 4019 in February 2006. 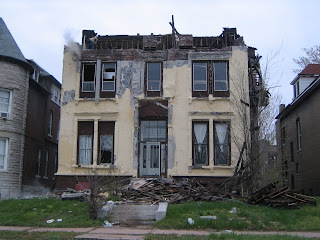 All three had demolition permits applied for when I checked City records in early April 2006. 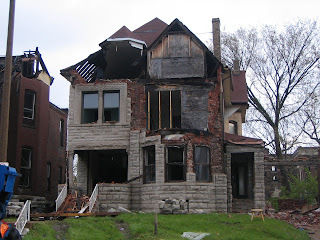 When Alderman Terry Kennedy found out that the homes were to be demolished there were reports that he initially expressed a desire to have the homes rehabbed instead of demolished. Apparently Saaman was able to convince Kennedy that renovation was not feasible, and thus demolition moves forward. This is an argument that would not be out of the realm of reality for Kennedy to believe, for as I mentioned in a post about the homes last year by Steve Patterson, two of the three were in pretty rough shape, and without historic tax credits, it could be tough to make the numbers work. Below are photos of the homes as they are being demolished taken yesterday morning and this evening. The scene of the three homes in a row in various stages of destruction reminds me of photos of areas near this block that were hit by a massive tornado in 1927. It just makes you sick! Thanks for the updated photos Paul. I agree with you, its just absolutely depressing. To me its just insanity since there finally seems to be some signs of life around there. Who is this Saaman? His new building are UUUUUGLY. Let's all boycott them! Nobody should even look at them! I saw the demolition as well. I am glad my camera isn't working because I simply would like to forget this happened.